As I've been digging into these early non-horror titles from the UK's Hammer Films a few have taken me by surprise, such is the case with the Never Take Candy From a Stranger, a black and white thriller that was years ahead of the game in regard to the taboo subject of pedophilia and the sexual abuse of children, even touching on child-murder! We have a British couple moving to a small Canadian village where the father Peter (Patrick Allen, Night Creatures), has been appointmented as principle of the local school. He is joined by his wife Sally (Gwen Watford, Taste the Blood of Dracula) and their freckled nine-year old young daughter Jean (Janina Faye, Horror of Dracula. One night when their daughter cannot sleep she makes an astonishing confession to her parents, that earlier that day she and her friend Lucille (Frances Green) visited the home of an old man named Clarence Olderberry (Felix Aylmer) who offered the girls candy to prance around naked in his home. As a parent just watching this I was gutted, it's like being hit with a sledge in the stomach, the parents are understandably shaken by the revelation, but when they approach the local police about it they get brushed off, no one wants to rile the feathers of the Olderberrys, a well-to-do family of some local repute who's roots go deep in the community, in fact the son of the old pervert seems to run everything in the town, from the high school to the asylum. However, the parents persist taking the case to court, what unfolds is a bit of a courtroom drama, the Olderberry's defense lawyer raking the newcomers to the community over the coals, grilling the young girl to the point of tear, and casting aspersion on the validity of the vile claims. The film is handled with some deftness, this is a topic that could easily have been more exploitative and unseemly than it already is, but it is captivating from the opening scenes of the perv watching the girls on a swing to the tragic final moments. I found the handling such a taboo topic in a small community who doesn't want to air their dirty laundry to be both fascinating and highly upsetting. The final act of the film takes place in a wooded area near a lake is a nail-biter, with two young girls in peril being chased through the woods by a silent but still menacing Olderberry, this sequence is particularly well shot by cinematographer Freddie Francis (The Elephant Man). This recent discovery from Hammer just might be one of my favorite non-horror thrillers them, such a great thriller, it really made me uncomfortable, as it should. Scream of Fear or Taste of Fear as it was known in the UK is a surprise filled suspense film concerning young Penny Appleby (Susan Strasberg), a wheelchair bound young lady who returns home from boarding school after her best friend dies in a drowning accident, only to discover that her beloved father has gone missing, and her cold step mother Jane (Ann Todd) whom at first seems to be ever so nice might be up to no good. Penny begins to snoop around for answers with the aid of her chauffeur Bob (Ronald Lewis), and begins to see visions of her father's corpse around the house, particularly in the guest house. Meanwhile her mother's friend Doctor Gerrard (Christopher Lee, City of the Dead) visits nightly and suggests the visions are a product of nervous disorder. Scream of Fear! is loaded with some very fine suspense and twisty turns, a top notch black and white thriller that makes great use of Penny's wheelchair, a scary accident that plunges her into the mansion pool is a particularly effective scene, loved this one. Audio/Video: Mill Creek Entertainment bring both Never Take Candy From a Stranger (1960) and Scream of Fear! (1961) to single-disc Blu-ray as a double feature. Never Take Candy from a Stranger is framed in 1080p HD widescreen (2.35:1) and looks quite nice in HD, Freddie Francis's black and white cinematography is nice reproduced, the final shocking scenario looking rather fantastic. Scream of Fear! gets a widescreen (1.66:1) presentation, also featuring some wonderfully atmospheric black and white cinematography from cinematographer Douglas Slocombe (Raiders of the Lost Ark). Both films have uncompressed English LPCM 2.0 audio with optional English subtitles. 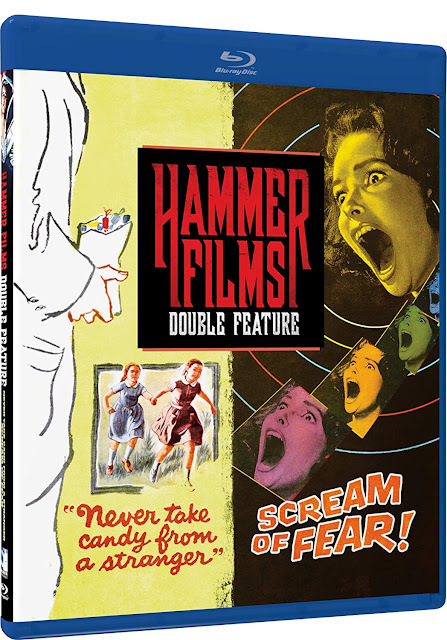 There are no extras on the disc whatsoever, bare bones just like all the other Hammer Films double-feature releases so far. Another high recommend for fans of vintage Hammer horror, this double-feature has a fine looking HD transfer for both films and for the price (less than $9) it's hard to go wrong.